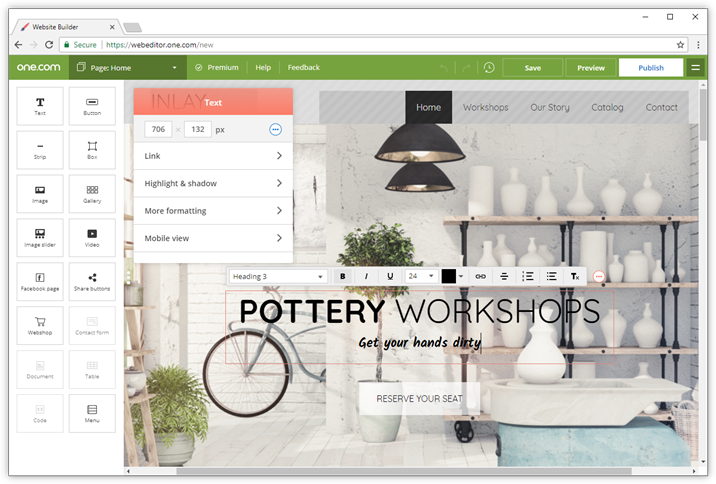 Website Builder is a web based tool that you can use to make your website. It is very easy to use and does not require coding knowledge. Simply drag components on your page and drop them at the desired location. The standard version of Website Builder is included with all web hosting subscriptions. It gives access to all components, most features, and allows you to publish up to five pages. If you want to publish more pages you can upgrade to Website Builder Premium. To help you get started with your site, you can choose between a lot of beautifully designed templates. Browse the categories and select the design that appeals you the most. Some templates are only available for Premium users. Fully customizable templates - Choose from numerous professionally designed templates to start building your site, all templates are fully customizable. Premium users get access to exclusive Premium templates. Mobile version - Adjust the layout of your site, so that it's optimised for mobile devices, for example to exclude images. You can preview your site in desktop and mobile version. Responsive templates - Responsive templates that adjust to the size of the screen of your user, so it's always shown in the best possible way. Page layouts - Pre-designed page layouts that adjust to your styling and template. Choose a restaurant menu, contact page, gallery and more. Social media sharing - Make it easy for your visitors to share your site with social media buttons, or add a link to your Facebook page. Slide show and gallery - Add movement to your site with a slide show, or align your images perfectly in a grid with the gallery component and draw more attention to your site. Style management - Make sure your site has a uniform look about it. Set the overall styling of your website, for headers, links, buttons, menus and text. Google fonts - With Google Fonts you have more than 800 fonts to choose from. Simply select the font you need and import it to Website Builder. Contact form builder - Create forms on your website, with text fields, drop down menus or check boxes. You can adjust styling of the text and buttons. Insert custom code - Use the code component to insert custom code in your website, for example for Google Analytics and other third party apps. Online shop (Try for 2 weeks) - Subscribe to the One.com Online Shop and use the Online Shop component to add it to your Website Builder site. BONUS! 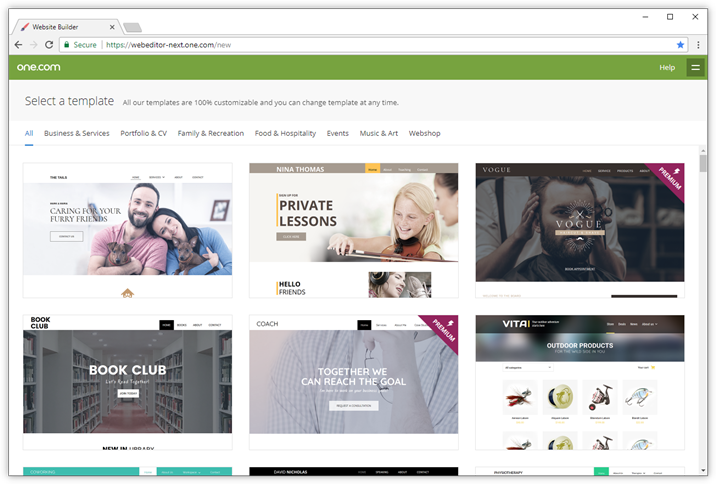 Included with the Online Shop is a free upgrade to Website Builder Premium. Retina ready (Premium) - Show your images in the best way possible, if your screen is HD, then your images will be too. Restore function (Premium) - Easily revert back to an older version of your website, with just a few clicks. You can save up to 200 versions.